If you want to instantly know how well a marketing plan, project, or business initiative is performing, then turn to dashboard software. This visual business tool helps you make real-time, data-driven decisions. Dashboards use data you’ve been collecting to display how something is performing at a particular point in time. Many people are familiar with dashboard software that focuses on key performance indicators (KPI), but dashboards can be used to measure just about anything and they are highly customizable. You can choose from a multitude of graphs, colors, styles, and import a variety of data points from disparate locations to create a dashboard. This guide will help you figure out the features you need so you can choose the best dashboard software for your company. Is Free Dashboard Software Worthwhile? Dashboards are an essential tool for gathering the Business Intelligence (BI) needed to make educated decisions that affect overall business growth. Unlike flat graphs and charts that tend to cover a historical time period, you can use dashboard software to interact with current data to spot trends and make your business run more efficiently. Although you may initially use dashboard software to look at a data set, you can drill down even further to display even more information that reveals more of the story. The types of dashboard software available are as varied as the data they can provide. Although dashboard software can pull data from many different sources, a solution that focuses on a specific need will likely be a lot easier to use. BI Dashboards: This software usually offers a suite of dashboards that focus on specific areas of your business such as analytics, strategy, operations, overall performance, and KPI. You’ll also find tools for monitoring parts of your business and for gathering informational data that tells a story. KPI Dashboard Software: Often found as an element in BI dashboards, this is a dashboard that focuses solely on delivering and analyzing key performance metrics. Typical KPI dashboards can evaluate sales growth, measure the effectiveness of marketing campaigns, and analyze a company’s financial health. Website Dashboards: Ever wonder how your website is performing or if your online marketing strategies are working? There are dashboards specifically designed to monitor metrics and display them at a glance. You’ll typically be able to add widgets for services like Google Analytics, GitHub, Pingdom, and Chartbeat to dashboard software that monitors website performance. You can also create custom data sources and incorporate social media monitoring. Open Source Dashboards: There are a variety of open source dashboard software options that you can use to build your own dashboards. Many of the open source options are web-based, but there are a few that are server-based. Additionally, these dashboards are ideal for integrating custom data streams. However, there typically isn’t a ton of support available. Free Dashboards: Not ready to invest in dashboard software? No problem. There are plenty of free options available. However, the free solutions aren’t as robust as other options available and have limited features. If you’re interested in seeing what real-time data analytics can do for your company, free dashboard software is a good place to start. Marketing Dashboards: This is another type of dashboard that you might find in a BI dashboard. These tend to focus on how well marketing efforts are increasing sales or building awareness. Marketing dashboards collect KPIs and critical metrics, and display that data in a meaningful way. These dashboards can also cull data from cloud services. Executive Dashboards: While not as in-depth as other options listed, executive dashboards are full of vital real-time data that provide executives an overview of their company’s performance. 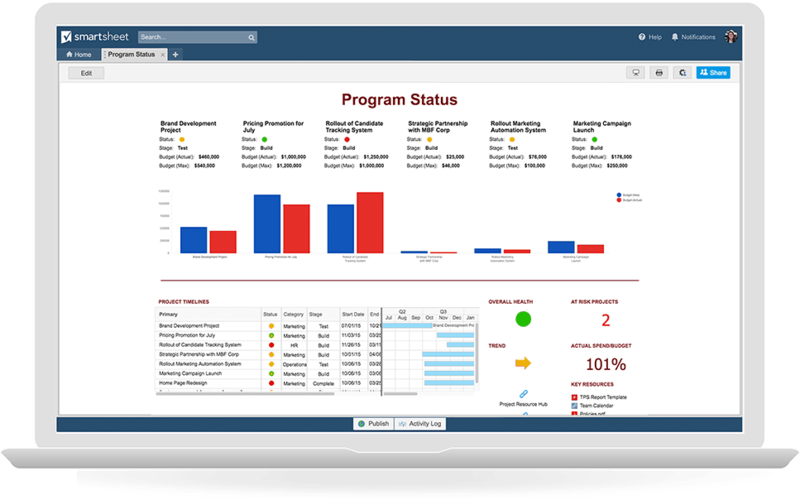 Typically, executive dashboards consist of data from accounting software, website analytics, and customer relationship management (CRM). Real-Time Dashboards: By their very definition, dashboards provide real-time data. Reports, conversely, offer information based on historical data. Real-time dashboards are instantly updated so you can see how something is performing at that very moment. Dashboards are effective because they tell a story in real time and provide information that can be used to quickly make business decisions. The ideal dashboard is typically a page. You should be able to see everything you need in that view. Just because a dashboard has access to tons of data, doesn’t mean you should see all of it at once. Regardless of the type of dashboard software you choose for your company, many of them have similar features. Here’s a list of the most common features you’ll find in dashboard software and what you can do with them. Customization: You should be able to customize your dashboard to access the data you want and view it in a way that makes sense to you. The dashboard software should also provide a way for individual users to customize what they’re viewing as well. Drag-and-Drop Interface: Using a drag-and-drop interface lets you pick the dashboard elements that you want to see and place them where you want on the page. This method is also how you would add widgets to the dashboard to bring in more data. It’s a straightforward and easy way to display the data where and how you want in the dashboard. Select Colors and Fonts: Dashboards are visually appealing and one way to make them even more so is to choose the color and fonts that you’ll use to display your data. Having this type of flexibility is great for companies that want to use some of the data as a sales tool and would like the color scheme and style to match that of the company logo. Cloud-Based: There are many benefits to using dashboard software that resides in the cloud. A cloud-based dashboard can be easier to deploy and maintain, plus it’s accessible on multiple devices virtually anywhere. In some instances, especially for monitoring things like websites and online marketing programs, a lot of the data you’ll be analyzing already resides in the cloud. Be sure to find out if there are any storage limitations with these cloud-based dashboards. Mobile Options: Many dashboard software options have mobile counterparts that let you view the data on tablets or smartphones. If this is important, make sure the data you want to view is available in the mobile format. If there isn’t a mobile app, you still may be able to access dashboards remotely if it’s a web-based solution. Data Drill Down: The dashboard presents a view of data that is a snapshot of a point in time. You can learn more about any element on the dashboard by clicking on it. The information that appears after clicking is the data drill down. This action takes you from a summary overview to a more detailed view of the data. Some dashboard software limits the number of drill downs you can perform. Plugs into Your Databases: Whether you’re using a proprietary or popular database (such as SQL, Oracle, SAP, etc.) to store your company data, the dashboard software you select should be able to plug into it and access the data. With this in mind, create a list of where you want to get the data that will populate dashboard and make sure the solution you select is compatible with those databases. Dashboard Component Graphics: The graphics are used to display the data in the dashboard. There are many options available beyond the typical chart or gauge graphic. Some graphic options that are available are speedometers, area and line charts, dot plots, pivots, and interactive graphs. Private/Public Dashboards: This depends on you and how much of your data you want to expose. Private dashboards let only a few people access your company’s dashboard. The key feature here is control and having the ability to either share your dashboard with everyone or just a few people, and how you want to accomplish it. Incorporate Various Data Sources: Data can come from just about anywhere; it’s not just limited to your company’s internal database. You may want to incorporate data from Google Analytics, Twitter, and other social media platforms in a single dashboard. If that’s the case, make sure the dashboard software you select will let you incorporate data from those sources. Works with Excel: Small and midsize business (SMB) often keep a lot of their data in Microsoft Office tools such as Excel. It’s important that the dashboard can not only access and analyze data from Excel, but it should also to export data as well to Excel or a PDF. Amount of Users: Depending on the type of dashboard software you select, there could be a limit to how many users can access it. Additionally, there could be limitations on how many people can view a dashboard simultaneously. Be sure to ask if there is a cost to add more users. This will be important to know when evaluating deployment and maintenance costs. Dashboard software can do a lot, and it can be expensive. However, there is plenty of free dashboard software available. Even if you’re not spending money on it, you’re still spending your time so you may be wondering if free dashboard software is worth it. There are limitations, but there are also some benefits. Free dashboard software is a good way to see if it will be useful to your business before making a big investment. If you do want to go the free dashboard software route, try using a product from a company that also offers a more robust version for a fee. This option will make it easier to upgrade in the long run and also help you determine if that company’s solution is what you want. There are also drawbacks to free dashboard software. These options do not have nearly as many features, and there can be limits imposed. For example, if the dashboard software is cloud-based, there may be storage limits. Other limits may include the types of reports you can run, how often you can refresh the data, and how many users can access the dashboard. Since it’s free, there isn’t going to be a lot of support. Finally, free dashboard software may not integrate with your databases or data sources. Before investing in any dashboard software, first evaluate your needs. Create a list of the data sources you’ll want to integrate into the dashboard. Identify the type of information you’d like the dashboard to measure. Consider how many people in your organization will need to access and use the dashboard. Decide what type of devices you want to use to view the dashboard. Finally, try out a couple of options. Most dashboard software comes with a free trial. This is an ideal way to find out if the product does what you want, if it has the support you require, and if you like using it. One thing is certain -- whether you’re a CEO, marketing executive, or project manager, having immediate access to real-time data can be a game changer for your business. One tool worth consideration is Smartsheet, an enterprise work management platform that fundamentally changes the way teams, leaders, and businesses get work done. Over 70,000 brands and millions of information workers trust Smartsheet as the best way to plan, track, automate, and report on work.